Some friends were organising a surprise birthday dinner recently and Eriki was chosen after being recommended. Being a Friday I was vegetarian and as most of those attending the dinner were also vegetarian or happy to skip the meat, we indulged in a full vegetarian meal. I have driven past Eriki many a time on my way to Baker Street, but as I’ve mentioned before, Indian food is not generally a preference when eating out, so had never really had a reason to taste the food. We drove down to Finchley Road on the day and were quick to take the first parking space we found (outside Finchley Road Station), feeling especially chuffed given the fact that Finchley Road is a bit of a pain with regard to parking. Our smugness was quickly washed away when we realised the restaurant was infact further down the road, somewhat closer to Swiss Cottage. Complaining of the cold we quickly made our way. We walked into the restaurant and were seated rather promptly at our table along the back wall, obviously the best place to sit at a surprise dinner and the birthday girl was quick to pick us out, despite a few of us attempting to hide behind the rather funky wooden cased menus. Given that those attending the surprise were starving, as soon as the birthday girl arrived we ordered the foods we had already picked out. Our starters arrived and we dug in. First up was the Masala Dosa. 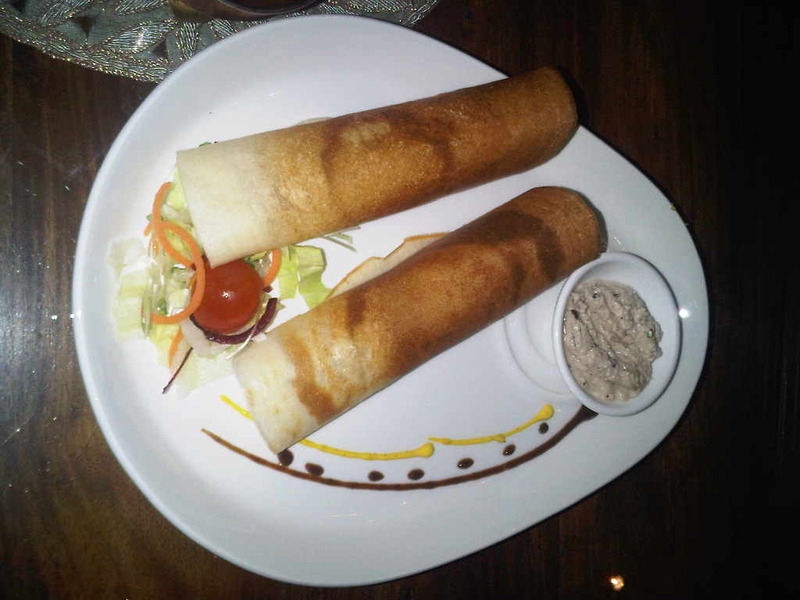 I have tasted alot of Masala Dosa’s in my time and I must say, this one didn’t really leave a lasting memory. It was pleasant enough and the masala wasn’t spicy, but not really a life altering experience. 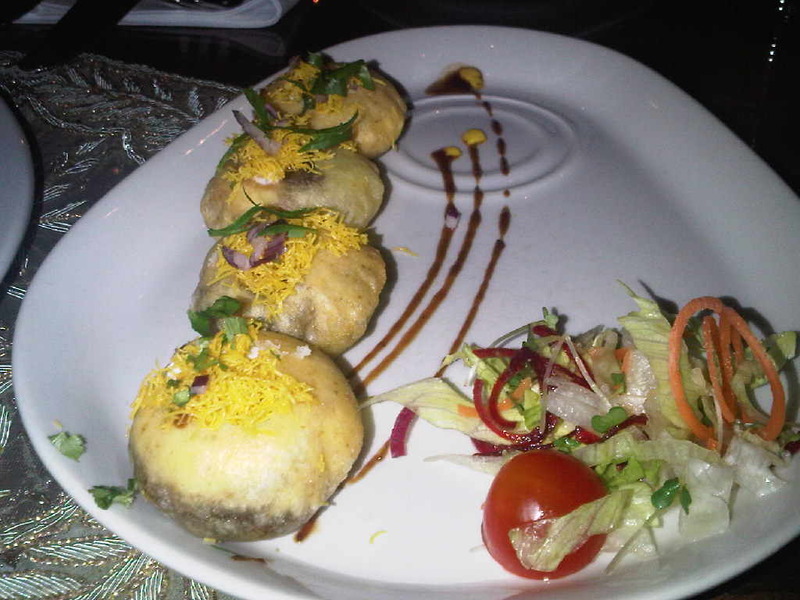 The Dhai Batata Puri came next. These I have to say were quite nice. It is easy to serve these with a soggy base and these were still perfectly crunchy so they get a thumbs up in my book! 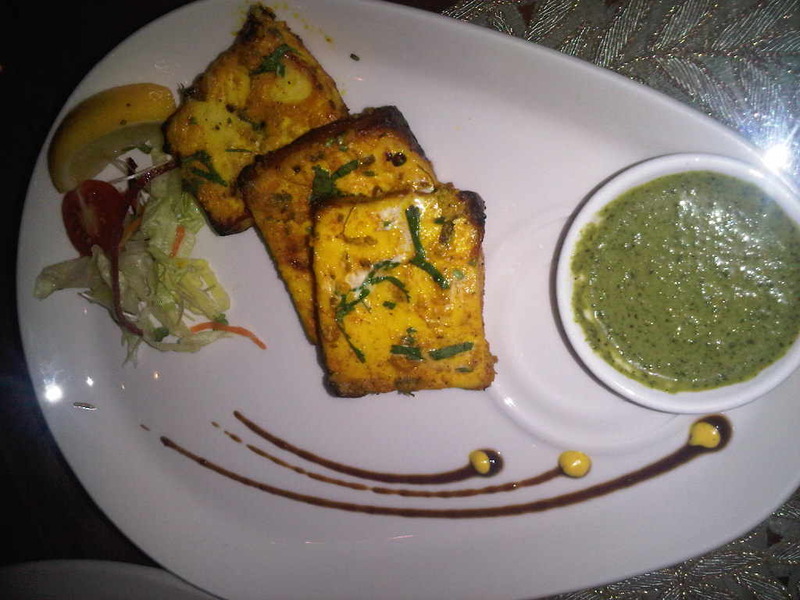 Last was the Paneer Pudina Sola (Paneer tikka). The paneer was still soft, although I would have like a little more masala, but obviously the restaurant is catering for a more western pallet and that’s fair enough. Our table was cleared fairly swiftly after we’d completed our starters. We were given a new set of menu’s so that we could order our mains. Being a group of 8, the menu’s were passed around a few times before we decided what to eat. When it came to placing the order I casually asked the waiter how big the portions were so as to judge how many portions of each dish we needed to order. The waiter looked at me like I was absolutely nuts and then asked if I would like to see the bowl. It took me a whole 30 seconds to comprehend what was going on and when I finally figured it out, I said yes. The waiter came back 5 minutes later. Low and behold he was carrying a tray, in the centre of which was indeed an empty white bowl. He held the bowl proudly in the air for all of us to see and when he had all of our attention he said ‘this is the bowl’. By golly I think he’s a genius, if anyone deserved the 10% discretionary service charge, it was this guy! Once we were over the bowl/portion situation, we got on with the ordering, I placed our order and stupidly asked how many naan’s come in a portion. Our clever waiter rolled his eyes and responded ‘one naan….cut into 4 pieces’. I looked round the table and my friend answered that we should get two portions. Having dealt with the ordeal of choosing our mains, we waited for them to arrive. Within 5 minutes my waiter friend was back, this time to advise me that the rice bowl is smaller than the bowl he showed me and would I like to order another portion. I declined. The Khas Tandoori Aloo came first. I wasn’t impressed. It tasted like a baked potato rubbed with a bit of tandoori masala. The Shahi Paneer Makhani came next. Again, I wasn’t impressed. This tasted like paneer cooked in tomato soup spiced with a little masala. The Kali Dhal that we received next was actually quite nice. The flavours were good and it was cooked well. 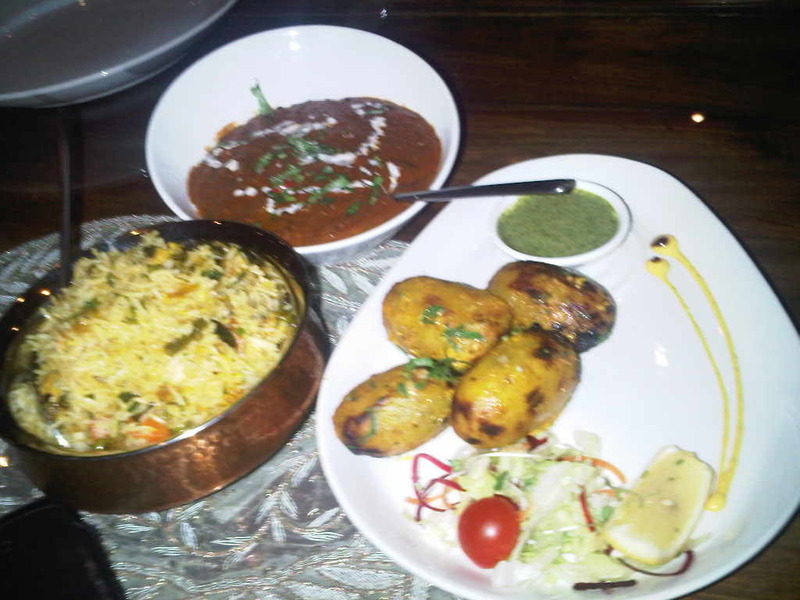 The Vegetable Biriyani was nice too, again good flavours, not over spiced and was served with a cucumber raita which complemented it well. Overall I wasn’t bowled over by Eriki. The starters were fair, but the mains really weren’t all that impressive. The bill came to approx £17 each which isn’t so bad, but I’d have to go back to sample the meat dishes! Hopefully I’d get the same ‘helpful’ waiter to assist me! The best dosa in london is at Sangeetha (kenton road)…but if you go i’ll tell you which one to order! Yes, theirs is extremely good, were regulars. I love the extra crispy paper thin dosa!! Mmmmm!! the meat dishes aren’t any better…! Haha, in that case, maybe I’ll skip the next visit! Greetings. We are attempting to link your posts to Urbanspoon, but the Spoonback is not publishing correctly (the blue widget should link to Urbanspoon’s restaurant listing). Can you please try reposting the code and letting me know when you have done so?